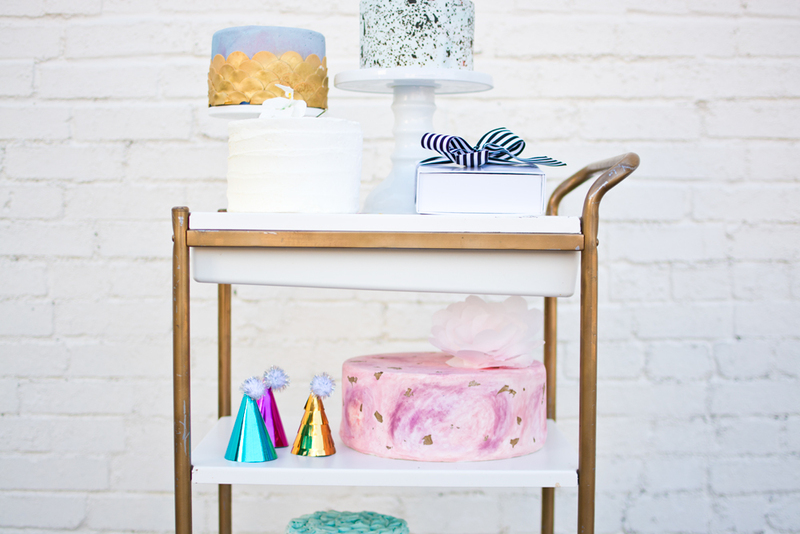 Turn your bar cart into a CAKE cart for a sweet twist on your next celebration! There is always room for dessert, amiright?! This bar cart setup, complete with cakes from The Hospitality Sweet, is just begging for a birthday party! I used cake stands at differing heights to create this fun display of cakes that would be a great way to utilize your bar cart if you have drinks set up elsewhere. I love cake and have no problem cutting into a cake that hasn't been touched yet, but some people are intimidated by cake. That's ok. Quick party tip: If your crowd is the type that is intimidated by cake, you could also serve an assortment of cupcakes, cookies, cake balls, or other sweet treats that aren't as scary. Your shy guests will thank you. To create visual interest, use cakes or desserts that have some unique details or aren't all the same design. Which cake is your favorite? Of course, I love the cake with the pink swirl frosting! Happy Friday, friends! Don't forget to celebrate something this weekend! Cakes by The Hospitality Sweet. Photos by Champagne & City Lights.